OAK 311 has received this issue. Your service request ID is #896103. Please check back for status updates, or contact us directly at 510-615-5566. The City of Oakland addressed this issue on 04/18/2019, service request #896103. Thank you very much for addressing this issue so quickly! Parked in red zone LP# 4CCG708 Chevrolet minivan. Been parked here all day. OAK 311 has received this issue. Your service request ID is #896697. Please check back for status updates, or contact us directly at 510-615-5566. OAK 311 has received this issue. Your service request ID is #893985. Please check back for status updates, or contact us directly at 510-615-5566. The City of Oakland addressed this issue on 04/19/2019, service request #893985. OAK 311 has received this issue. Your service request ID is #896718. Please check back for status updates, or contact us directly at 510-615-5566. OAK 311 has received this issue. Your service request ID is #896554. Please check back for status updates, or contact us directly at 510-615-5566. This pothole which was reported many times has now given way to about a foot deep. Directly in path of ambulances coming to highland hospital. Please patch ASAP. OAK 311 has received this issue. Your service request ID is #886049. Thank you, in advance, for your patience as we work through a backlog of pothole service requests. Unfortunately the City does not have enough funding to repave all streets in poor condition. With limited funding, our response to resurfacing requests is limited to minor pavement and pothole repairs only. Our Street Maintenance Department will assess your street and determine whether temporary measures might be appropriate. Please understand that this work may be limited to pothole or other minor repairs, and that we have many similar requests. We will do our best to respond in a timely manner. The backlog of streets in Oakland needing pavement currently is $435 million and growing. Can we please fix this dangerous pothole in front of a hospital? OAK 311 has received this issue. Your service request ID is #896503. Thank you, in advance, for your patience as we work through a backlog of pothole service requests. Unfortunately the City does not have enough funding to repave all streets in poor condition. 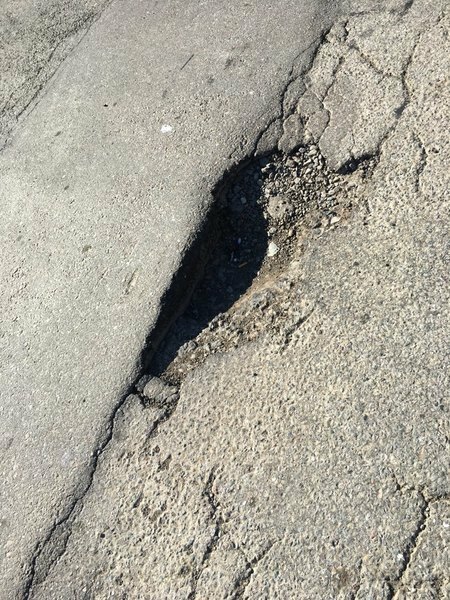 With limited funding, our response to resurfacing requests is limited to minor pavement and pothole repairs only. Our Street Maintenance Department will assess your street and determine whether temporary measures might be appropriate. Please understand that this work may be limited to pothole or other minor repairs, and that we have many similar requests. We will do our best to respond in a timely manner. The backlog of streets in Oakland needing pavement currently is $435 million and growing. OAK 311 has received this issue. Your service request ID is #896461. Please check back for status updates, or contact us directly at 510-615-5566. OAK 311 has received this issue. Your service request ID is #896199. Please check back for status updates, or contact us directly at 510-615-5566. The City of Oakland addressed this issue on 04/17/2019, service request #896199. OAK 311 has received this issue. Your service request ID is #892652. Please check back for status updates, or contact us directly at 510-615-5566. The City of Oakland addressed this issue on 04/17/2019, service request #892652.